Mtech’s Maryland Industrial Partnerships (MIPS) funding recipient WellDoc®, developer of the first FDA cleared mobile prescription therapy, BlueStar™, recently announced that it received funding from its first institutional investors, Merck Global Health Innovation Fund and Windham Venture Partners, as part of a $20 million round of financing that now broadens its capitalization beyond its initial group of angel investors. For a limited time, WellDoc and its investors will also explore the possibility of adding co-investors that bring strategic value to the company. "Our new investors share WellDoc's vision of fundamentally changing how people manage their chronic diseases to improve outcomes and reduce costs," said Ryan Sysko, co-founder and CEO of WellDoc. "This investment will help WellDoc launch and commercialize BlueStar, the world's first Mobile Prescription Therapy for type 2 diabetes, on a nationwide basis." WellDoc's flagship product, BlueStar, is a first-in-class, patient-centered product cleared by the U.S. Food and Drug Administration in July 2010 for use by adults living with type 2 diabetes. BlueStar requires a prescription from a licensed healthcare provider and can be dispensed and reimbursed through a pharmacy. The new product is powered by WellDoc's proprietary Automated Expert Analytics System™ and enables patients to self-manage their diabetes through real-time motivational, behavioral and educational coaching. BlueStar coordinates care by helping patients adhere to their treatment plan while also providing clinical decision support to the patient's healthcare provider to optimize treatment decisions. WellDoc's 2008 MIPS project teamed the company with Charlene Quinn, associate professor, University of Maryland School of Medicine, for clinical trials to demonstrate the effectiveness of the company's DiabetesManager product. The company also wanted to prove that its easy-to-use diabetes management system could be implemented on a large scale. Quinn and WellDoc evaluated the effectiveness of a patient-to-provider interactive diabetes management system that could be utilized with readily available personal electronic devices. In the MIPS phase one project, patient diabetes management algorithms were revised to test the effectiveness of the WellDoc intervention for a larger, randomized control trial (RCT) conducted in the phase 2 MIPS project. 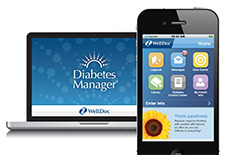 The randomized control trial involved 30 patients, who were given WellDoc’s cell phone-based diabetes management software, which securely captured data and provided real-time diabetes management feedback. In addition, WellDoc’s system analyzed patient data and provided suggested action plans to patients’ healthcare providers (HCPs). The solution promoted patient self-management and enhanced communication between patients and their HCPs. The MIPS study showed that adults with type 2 diabetes using WellDoc’s software achieved a 2.03-point reduction in A1c, an indicator used to identify the average blood glucose level of a diabetic over a 12-week time period. Every one-point drop reduces the risk of diabetes complications (e.g., amputations blindness) by as much as 40 percent. The top ten diabetes drugs in the U.S., on average, reduce A1c by about one point. The results of this trial were published in Diabetes Technologies and Therapeutics, Volume 10, 2008. Dr. Quinn then conducted the first, one-year randomized controlled trial (RCT) of a mobile phone-based diabetes coaching and decision support intervention, the results of which were published in Diabetes Care, the world’s preeminent diabetes-focused scientific journal, published by the American Diabetes Association. The trial met its primary endpoint of reducing blood glucose levels over one-year, demonstrating patients using the WellDoc system plus their usual care had an average decline in A1c of 1.9 percentage points compared to a 0.7-percentage-point decline seen among patients treated with usual care alone (control group). According to the American Diabetes Association (ADA), more than 45 percent of all Americans suffer from at least one chronic disease and 25.8 million people in the U.S. (approximately 8.3 percent of the population) suffer from diabetes. The ADA estimates the total annual cost of diagnosed diabetes in 2012 was $245 billion, including $176 billion in direct medical costs and an additional $69 billion from reduced productivity. MIPS, a program of the Maryland Technology Enterprise Institute (Mtech) in the A. James Clark School of Engineering at the University of Maryland, supports university-based research projects to help Maryland companies develop technology-based products. Commercial products benefiting from MIPS projects have generated more than $25.2 billion in revenue, added thousands of jobs to the region, and contributed to successful products such as Martek Biosciences’ nutritional oils, Hughes Communications’ HughesNet™, MedImmune’s Synagis®, and Black & Decker’s Bullet® Speed Tip Masonry Drill Bit.